In another symptom of the coming era of mobile broadband and ubiquitous networking, Korea Telecom has announced that it plans to buy a large stake in BC Card and eventually gain management control of the company. 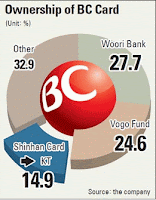 According to the Joongang Daily, KT has already signed a memorandum of understanding to acquire Shinhan Card Co.'s 14.9 percent stake in BC Card (see graphic). A spokesman for KT said that "We see a great possibility in creating synergy between telecommunication and finance." An earlier post noted that e-business in Korea is mired in the past because of an overly-heavy reliance on Microsoft software, and legal requirements that led banks and other businesses to require the use of Microsoft's Internet Explorer and active-X controls for internet transactions. Obviously, Korea Telecom is looking beyond the present situation to a future in which most Korean consumers will use mobile broadband via iPhone, Android or other handsets. There are currently over 24 million mobile phones equipped with USIM (universal subscriber identity module) chips which can identify subscribers and store various content, including credit card information. In addition, KT is reportedly mulling over new services in which a customer might search for a restaurant using their smart phone, pinpoint its location, and pay the bill using a credit card and coupons downloaded to the smart phone from web sites. The mobile broadband era is coming to Korea, and it is going to arrive very fast, for the simple reason that consumers want mobility and they want these services, just as in other advanced countries around the world.